Let's see, second day of the work week. Check. List teaser from what we're reading. Check. This week's tease is from Chime by Franny Billingsley. "But it's my own blood!" I said, because that's how the Old Ones like it best--the personal touch. "And still warm." Here's the summary from Goodreads: Before Briony's stepmother died, she made sure Briony blamed herself for all the family's hardships. Now Briony has worn her guilt for so long it's become a second skin. She often escapes to the swamp, where she tells stories to the Old Ones, the spirits who haunt the marshes. But only witches can see the Old Ones, and in her village, witches are sentenced to death. Briony lives in fear her secret will be found out, even as she believes she deserves the worst kind of punishment. Sounds good, right? We think so! 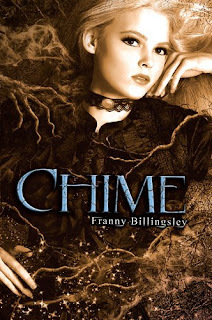 Chime, by Franny Billingsley, hardcover, 361 pages, is published by Dial Books and is available now. Teaser Tuesdays is a weekly meme hosted by MizB of ShouldBeReading. Ooh, that's a great teaser!! I'm very intrigued.